hoped it would, so I’m starting back at square one on a few things. Since our bed sits between two windows, I like the idea of tall board and batten as an accent behind the headboard – plus, it helps break up all the black furniture. This white romper and colorful patchwork jacket are the epitome of cool-girl summer style. I love to have personal photos around the home to make it feel more personalized, and these hanging frames would make a great addition to either our entryway or upstairs hallway. I never thought I would gravitate toward a rustic-meets-modern feel for our home, but that’s what I’m loving these days so I’m rolling with it. This DIY mirror tutorial will look great in our dining room (eventually). Jenn nailed this recipe for quinoa-stuffed mushroom pizzas – even though I’ve never tried quinoa, I’m going to now since this recipe looks so darn delicious! Don’t ever let anybody tell you that furnishing a house isn’t expensive. Guess what – it is! This post offers some great tips on how to decorate to your taste while still staying in budget. I’ve been trying to incorporate more eggs into my daily meals, so this omelet-grilled cheese deal looks right up my alley. 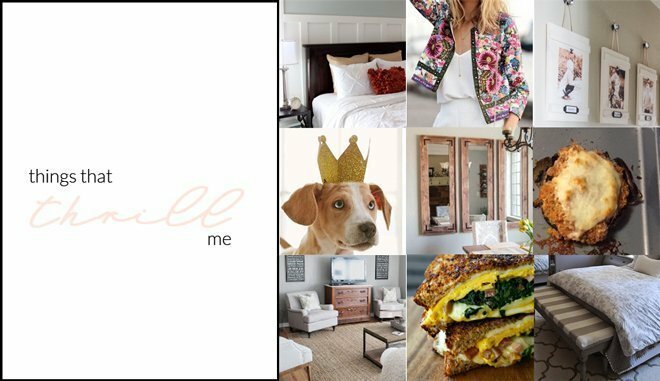 While perusing the Web for some home inspiration, I came across Dear Lillie, and it’s now one of my new favorite blogs. Her design aesthetic is very similar to what I’m trying to achieve, and many of the signs that she shows in her home are for sale through her store! Oh great inspirations… Can't wait to see your bedroom! You seriously find the best round ups girl and definitely give me bloggers to crush on!!! Love her style! I love decorating and never want to stop…but my wallet always ends up being a real decor block. All wonderful ideas today, really like the idea for the bedroom. The thing about decorating, is it's always evolving and changing (unless you're me, of course!) Happy Birthday to Finn, or should we say Feliz Cumpleanos!! You have got to get that crown for Finn!! So fun his birthday is Cinco de Mayo – extra reason for you and the Mr. to celebrate! Love all of these! And yes on the decor — when I first moved into my current apartment, I think I was shopping at least once a week! so expensive. You know how I feel about adding a little board and batten, go for it! Love that summer look with the romper and jacket, and those frames are awesome. Can't believe Finn will be 1 next week! Girl, I totally am right there with you on promised house posts that have yet to happen haha. I feel like so many rooms are CLOSE to being done but are missing a few pieces so I keep holding off from sharing them… but who knows when they'll actually be done?! Furnishing an entire house is no joke! Love Dear Lillie, too – shes one of my favorites! Thanks for the shout out girl!! I hope you like the quinoa! (I have some other tasty options to try that are even more flavorful if you want! Just let me know 🙂 I love the look of the tall board and batten! I've been contemplating doing that somewhere in our house as well! Love the way those frames hang. They'd look so good in any room. Good luck with your bedroom projects – good for you for starting over when you don't like the way it's turning out. Sometimes that's hard to do! Absolutely loving that romper and jacket! SO fun! And definitely checking out the tips on decorating!